Become an Energy Champion and see how much you can recycle. Help the environment by segregating the garbage being thrown. Collect the recycling dropped from above by the selfish workers and place them in the correct recycling bins before your carbon workprint becomes too big. Use the Left and Right cursor keys to catch the falling garbage. Then walk to the correct recycle bin and hit Space to recycle it. Watch out though as putting the wrong type of rubbish in the wrong bin will have a negative effect. Look out for the bin bags; they can contain any type of waste and you'll need to test them out on each bin to dispose of them correctly. 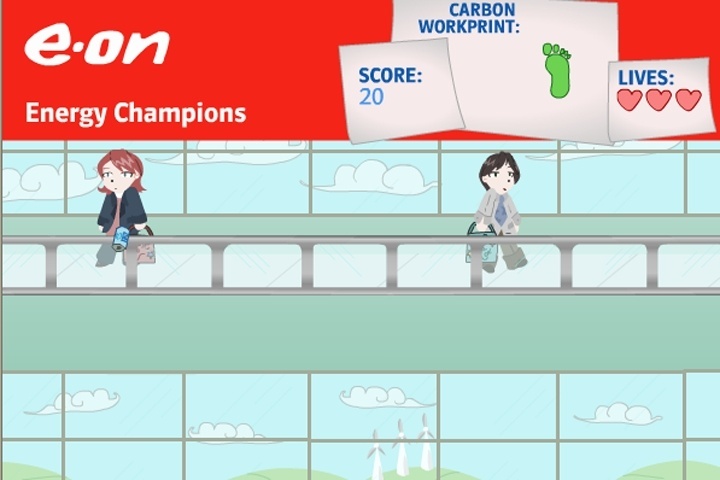 To become an E.ON Energy Champion your goal is to collect as much of the waste dropped by the workers above and place the rubbish in the correct recycle bins. If you want to play E-on Energy Champions games online you have come to the right place! GamesLoon adds new E-on Energy Champions games every week. This is your game portal where you can find the biggest collection of free E-on Energy Champions games online. Do not forget to rate our E-on Energy Champions free online games while playing!